1) How do you as a designer want to skillfully and creatively meet the realities of the Great Acceleration? (What kind of projects and actions do you think might be needed)? Upon the realities of the Great Acceleration, designers should not only analyze their working process to come up with alternative methods for the nature, but they should also remind the public about the importance of the sustainable systems through their works. For example, the designers involved in making everyday products need to study and ensure that the ingredients and process are both reusable and eco-friendly. Furthermore, one should try to minimize the possible harmful effects of the final product. From the earlier part of designing, conserving the nature needs to come first before the financial and functional aspects; at the same time, designers should focus on finding competitive yet environmental-friendly materials and products to appeal the customers. Also, one can consistently speak out to the public and the government by becoming part of expert groups or participating in social activities. 2) Research the word Anthropocene and write a short description that you would share with a close friend (using your own words/language to explain, not an internet definition). Images are encouraged. How resilient is your hometown ecology to climate change/the Anthropocene? Do people have a relationship with the natural environment today? Gather reported scientific data on climate change and the vulnerabilities of your hometown or region. What human or environmental systems are affected by climate hazards? Are people doing anything about it? Images are encouraged. Come to class prepared to discuss. 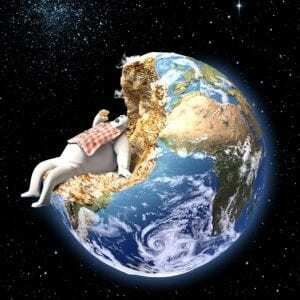 The Anthropocene refers to the modern age of the geological time scale where the earth is dominated by the humans. Officially, the period between the last Ice Age and the present is known as the Holocene. 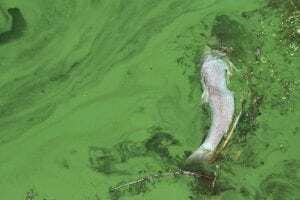 However, some scientists believe that at least for the time after 1950, it is more appropriate to use the term Anthropocene – humans are the greatest factor that affects the earth. Unfortunately, most of those influences are damaging the nature, as humans use up the resources and irritate the ecosystem. 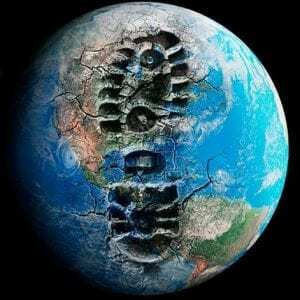 Figure 1 and 2 illustrate the concept of the Anthropocene and the destructive influence of the humans. 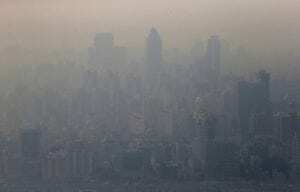 My hometown in Seoul, Korea is one of the typical cities with such issues. 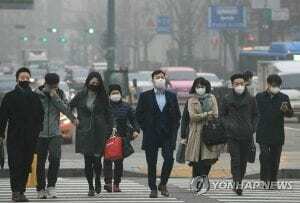 Korea has been rapidly developed in the past few decades, and it is suffering from the recent climate change and pollution. 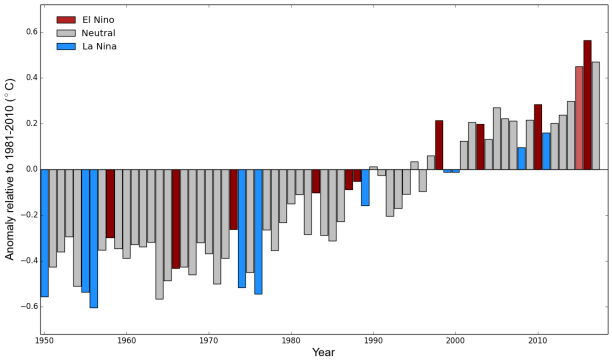 Every year there is a new record high temperature (Figure 3), and the abnormal weather resulted in more natural disasters and green tides (Figure 4). 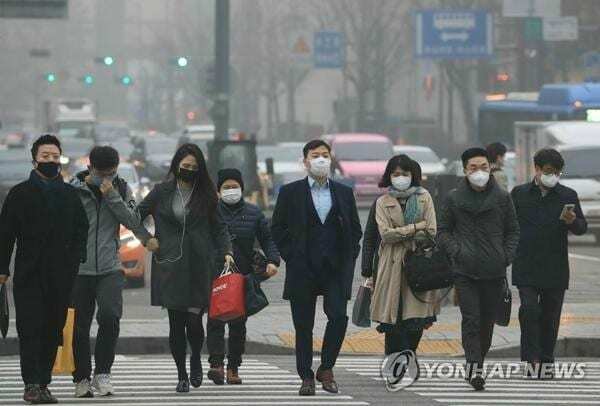 Especially, the harmful effect of the fine dust has become one of the largest social concerns of Korea (Figure 5), and people often wear special dust masks on their way to the work (Figure 6). As a result, the government and citizen organizations are trying their best to control air pollution and increase the renewable energy. 3) Next week we will tour the Donghia healthier Materials Library on campus. Please visit their site to learn about their work. What are you most interested in learning about at the library during the tour? I am interested in the extent of the use of healthier materials in the United States and the degree of the support from the government. What are two questions that you have for the librarian? 1. How much do we know about the commercialized healthier building materials, and how often are they used? 2. How much more expensive are the healthier materials and is there any support of the government to make them more competitive in the market? 4) Watch 2-3 videos from the Green Science Policy Institute’s video series (7 videos in total, each about 3 minutes long) on the “Six Classes of Chemical Concern.” Answer the following questions on your LP and come to class prepared to discuss your research and responses in class. Which videos did you watch? Explain in detail what was most surprising to you about the videos and why. One of the most surprising things about the videos was that the potentially harmful materials can be found in the variety of products used in everyday lives. For example, the fact that the soaps, the products that are designed to help removing germs, could actually result in health issues shocked me. Also, as an artist, I am more likely to be exposed by the harmful solvents; if I am not careful in choosing which tools to use, it could cause detrimental results. Furthermore, I have never imagined that eating rice or fish could put me into the risk of metal accumulation. Do you use any of these materials commonly in your work or personal life? Which ones? I frequently use paints, adhesives, and markers for my works regarding school projects. Also, there are a few personal care products I use every day, and the materials involved in cleansing and polishing are employed quite often. Certain food or water I consume daily are also not completely free of such materials. Will you change your behavior as a result of watching this series? I will try to check for the ingredients more carefully as I purchase products in the future. Also, it will be crucial to know more about the chemicals that are part of the Six Classes. However, certain materials that were previously thought to be safe could turn out to be dangerous later, so I should try my best to alert and update myself. Why do you think so many chemicals exist in contemporary design? I think with the development of science and industry, people found that certain chemicals can be used to produce the desirable results without too much cost. Even though they could be detrimental, it takes years of research to reveal their effects.